Inhaling a taste of the Middle East. Rob Mackdonald exhales slowly, a cloud of thick smoke unfurling as he passes the hose to his right. Next to him, a friend blows smoke rings into the heavy air, each hazy circle dissolving as it falls softly onto the thick carpet. “How’re you guys doing? Is it getting a little harsh?” asks Gina Ramos, co-owner and manager of the Hubbly Bubbly. Shisha, a molasses and tobacco mixture used in hookahs, burns when it cooks too long, filling the lungs with harsh, dry smoke. Ramos blows through the hose after clearing the bowl, pushing stale smoke into the room. When she inhales again, fresh smoke fills the hookah’s chamber. Behind her, a row of hookahs for sale sparkle in low overhead light. Original paintings by local artist Cody Zachow hang on the walls behind sheer curtains, depicting colorful women and trippy, abstract scenes. The Hubbly Bubbly is a sister to a much larger retail store in Spokane. But in Washington, hookah lounges aren’t common or even entirely legal. Indoor smoking regulations, according to Ramos, made opening a bar in Spokane next to impossible. That’s why the Hubbly Bubbly decided to cross the border into Coeur d’Alene to open a hookah bar while maintaining its retail store in the NorthTown Mall. 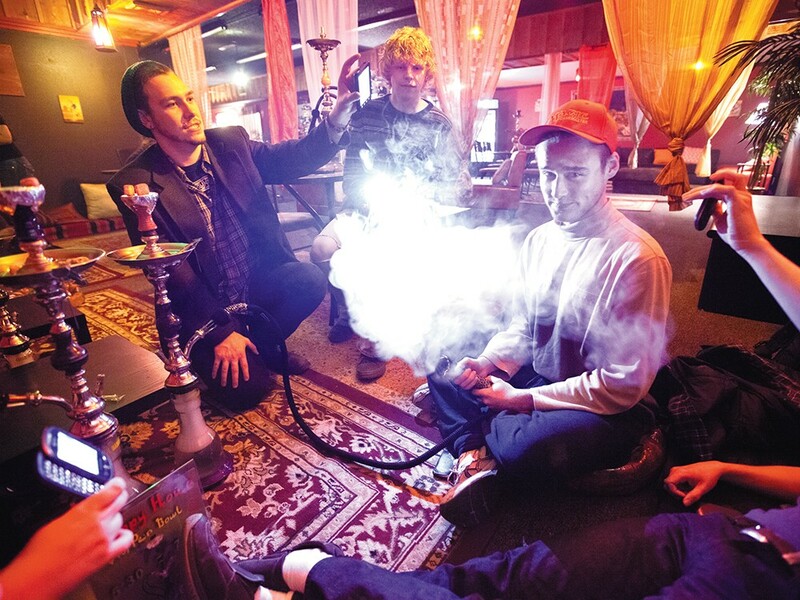 For more than three years, the Hubbly Bubbly in Coeur d’Alene has been one of the only operating hookah lounges in the North Idaho area. For Idahoans, the lounge is a bit of a cultural treat, an oddity. But for many in the Middle East, smoking is just part of the culture. “It’s a part of a culture in the Middle East, in northern Africa. To them, alcohol is the poison. This is what they do instead. Sit down, play cards, smoke hookah,’’ Ramos said. The most popular flavor at the Hubbly Bubbly? A fruity mixture of cantaloupe and fuzzy navel. You can even smoke your shisha out of a grapefruit instead of a traditional ceramic bowl. The Hubbly Bubbly exclusively serves washed tobacco as well, a cleaner alternative to other shishas.